Whether a firm uses hourly or non-hourly billing methods, there is an underlying cost structure that can be evaluated and often improved. To allow for maximum flexibility in practice mix, we prefer evaluating profit per hour at several micro levels. We also believe it is essential for firms to compensate partners based on the income they contribute and to empower partners to regulate their costs. The most difficult part of analyzing profit per hour relates to the allocation of cost. Specifically allocating timekeeper compensation and benefits and secretarial costs is easy to accomplish. Allocating the remaining overhead is much harder. Many firms use estimates based on an even apportionment to all lawyers. Some firms try to recognize the difference in overhead use by apportioning it on a graduated scale (rough justice approach), with partners receiving the most and paralegals receiving the least. Firms that require a finer measurement may use a combination of specific and estimated allocations for all expense categories. Systems that provide enhanced accuracy and transparency are more likely to be seen as credible, which will support quicker adoption by the partners. Since we believe the effort to create a well-designed cost accounting system and cost allocation process is worth it, we have created our example using this type of method. 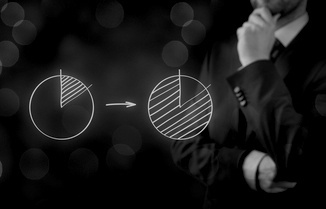 Lastly, firms that compensate based on profitability may want to consider a more detailed approach to cost allocation. 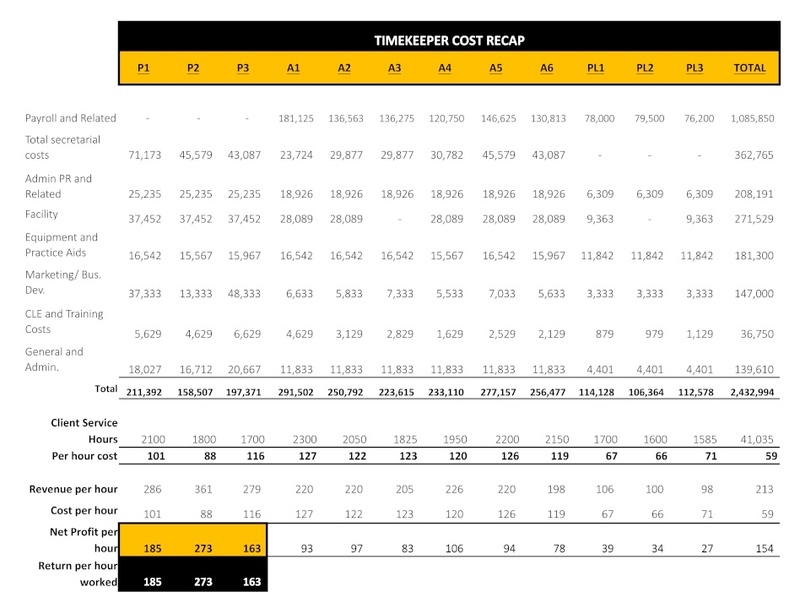 Consider the following cost approach used in our example. No partner payroll was assessed. Results were viewed in terms of return per hour. Some firms use a standard cost method to assign an amount per hour as a partner timekeeper cost. The benefit of this approach will be discussed in our next post. Direct allocation to each timekeeper. Direct allocation to each lawyer based on sharing agreements. Allocated based on billable hours by section. Allocated based on space usage standards. For example, average partner office, average associate office, average paralegal, average secretarial and average administrative space. Combination of specific allocations, per seat costs for IT and general allocations. Combination of specific allocation at the activity level and general allocations at the firm level. Combination of specific allocations at the activity level and general allocations at the firm level. Combination of specific allocations when identifiable (E.g. Malpractice) and general allocations based on applicable use. If you would like to see the detailed allocations methodology used in this example, please see the worksheets on our website: See WORKSHEETS. Associate 3 (A3) and Paralegal (2) work remotely and do not have assigned offices. This sample firm is assumed to have good cost accounting systems and can specifically track business development, CLE, Training, Library and other costs. Contract CFO, HR, and Accounting all work remotely and have no need for dedicated office space. The two schedules presented below include a revenue allocation by timekeeper and originator, and a cost allocation by timekeeper and by practice group. The sample practice areas include a fixed fee practice, a small practice, and a leveraged practice. Included in column 3 of the first grid are the revenue amounts generated per hour. As indicated earlier, a quality cost allocation system allows a firm to evaluate the components affecting the profitability of each timekeeper, section, and ultimately client. Compare the results in the table below. * Client service hours are synonymous with billable hours in an hourly practice. Notice the comparison of revenue earned per hour and cost per hour. In this model, partner payroll costs are set at zero and partner timekeeping receipts less applicable overhead are viewed as a contribution to profit for the working timekeeper. These profit contributions would then flow through to the partners’ compensation system. Firms that pay partners separately for timekeeper contributions could insert those amounts for partner payroll costs. In this analysis, Partner 2 (P2) has the best return per hour worked. P2 has the highest billing rate and is also more cost efficient than Partner 1 (P1) and Partner 3 (P3). P3, however, has the lowest timekeeper hours and gross dollar contributions. The same type of analysis is applicable to all timekeepers. Assuming the relationship between billing rates and demand is inelastic and billable hours are at or near maximum, a firm would be forced to look for other efficiencies to create profit. Comparative cost analysis at these micro levels can yield material cost saving opportunities. It has been my experience that the very exercise of creating these data is enough to spur some level of improvement. Tie compensation to these data (profitability) and the pace of change becomes rapid. Building a comprehensive data set will enable the creation of several different comparisons. 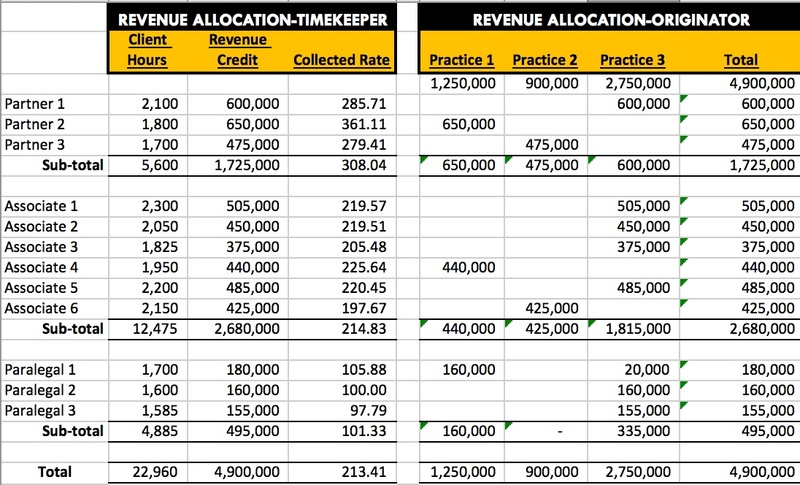 Consider the following cost and revenue per hour analysis with line item detail for each practice. Combining the returns per hour worked for all of the timekeepers in Practice 1 indicates an aggregate return of $406 per hour. P2 for example now has the data to consider if $133 per hour ($406-$273) is a fair reward for business origination, supervision, and training. A good compensation system will recognize fully these results in partner pay. In terms of percentage margins, Practice 1 is returning 47% and 25% on associate and paralegal time respectively. 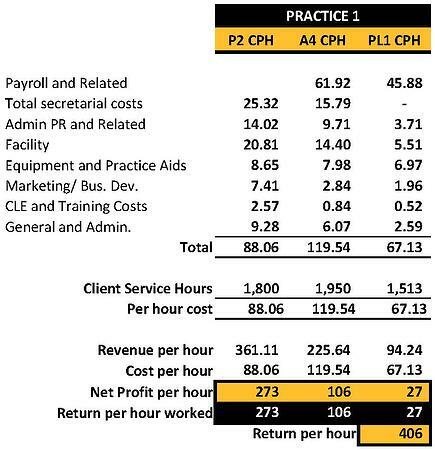 A comparison of line item paralegal costs per hour in P1 and P2 and P3 indicates a potential billing rate and hours worked issue more so than a cost issue. Several other comparisons can be made making these data even more useful. Practice 2 is returning only $242 per hour, with $163 coming from P3’s efforts and $78 coming from A6’s. 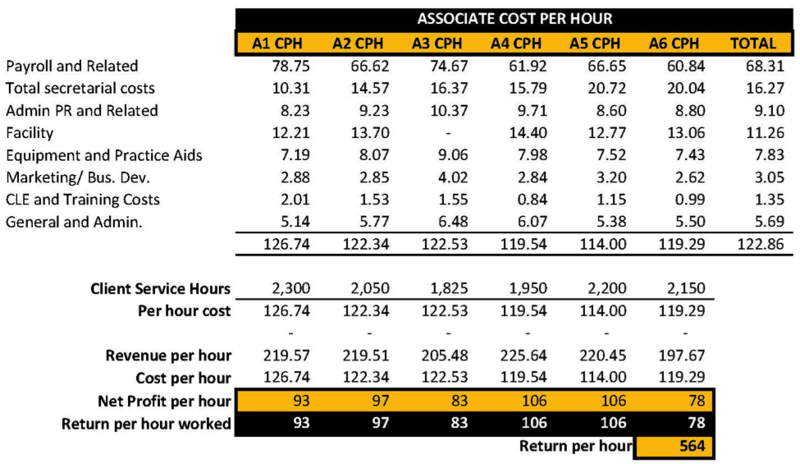 Comparing A6’s salary cost per hour to those of Practice 2 and Practice 3 indicates that A6’s hourly pay is the lowest of all associates. P3 has the lowest billing rate per hour, least personal billable hours, and has only one additional revenue contributor. Practice 2’s marketing costs are substantially higher than Practice 1 and 3’s, which may be indicative of a young and building practice. It is important to consider the non-economic or strategic components accompanying a result before fully weighing an interim profit per hour analysis. Practice 3 is returning $663 per hour, with only $185 per hour attributable to Partner 1’s time. Practice 3 also benefits from A 3 and PL 1 working remotely and not being subject to an office space allocation. In some firms, this can be controversial, but if this example were an actual practice and the remote attorney and paralegal were delivering the indicated results, it would be foolish to allocate overhead to these positions arbitrarily. As law firm’s look for ways to reduce costs and keep highly productive individuals, creative work arrangements can be a profitable option. Practice 3 has hit critical mass and is returning profits at or more than 40% on all associates and between 27-37% on Paralegals. 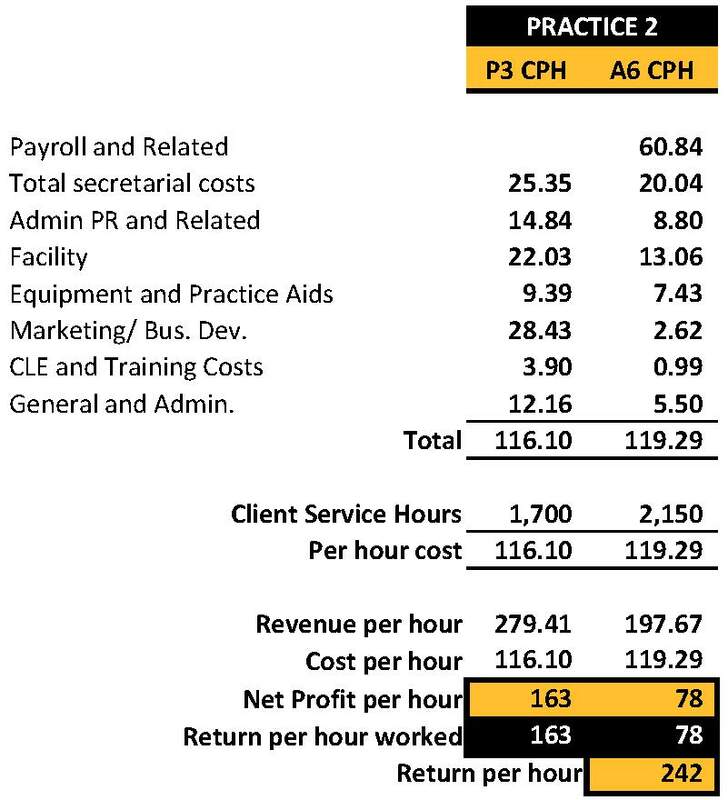 P1’s personal return per hour is at the median for this firm, and the profit on the leverage more than compensates for P3’s the lower hourly billing rate. 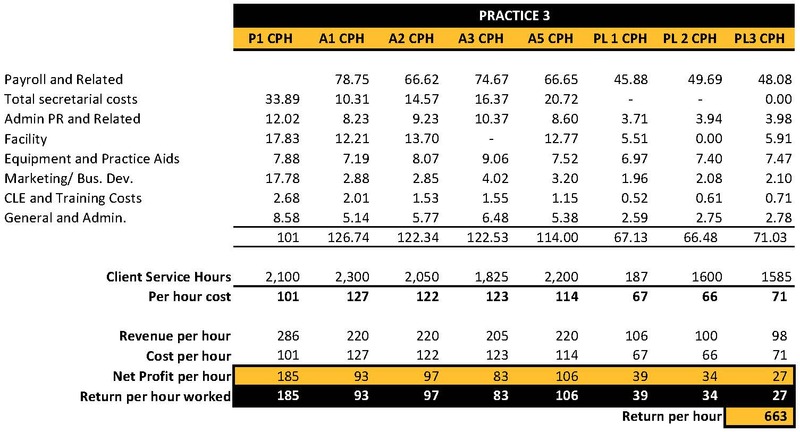 Comparing the salary costs of Practice 3 to those in Practice 2 and Practice1 indicates that Practice 3’s compensation costs per hour are higher in most instances, which is mostly attributable to bonus costs related to higher billable hours for A1, A2, and A5 (see sample worksheets). In this example, Practice 3 can tailor its cost structure to its economic drivers. Ultimately tying compensation to profits contributed allows these three very different practices to coexist in the same firm with each having the opportunity to practice efficiently and be rewarded accordingly. These data quickly indicate where improvement opportunities exist. Peer comparisons on a line item basis provide insights based on real examples occurring within the same firm. Outside benchmarks, while useful when reliable, are subject to interpretation, inconsistent cost groupings, and varied practice areas. Developing these data internally enables a firm to create unique best practices, which could lead to a market advantage. In our next post, we will take this analysis to the client and matter profitability level. Maximum value is achieved from this level of analysis when viewed from the firm's and client's (market) perspective.